Corneal disease encompasses a broad range of conditions, including infectious, inflammatory, structural, and traumatic problems. The cornea is the clear structure on the front of the eyeball that allows light to enter the eye. Therefore a clear cornea is an essential part of good vision. 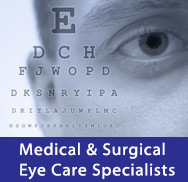 All of our physicians are trained to manage infectious and traumatic conditions of the cornea. We routinely diagnosis and treat injuries to the cornea as well as infections, especially in contact lens users. Dr. Samuel Berger is a fellowship trained specialist in corneal disease and corneal surgery. He performs corneal transplantation surgery and has expertise in the management and diagnosis of many eye conditions including Keratoconus, Fuchs Dystrophy, and many other hereditary corneal dystrophies. We are proud to offer state-of-the-art technology and medical expertise in the management of all corneal problems. For more information on corneal transplants, click here.